Luckily, there’s not much to catch up on – Pierce’s novels are characterized by fast-paced action, a relatively small and memorable cast of characters, and fairly simple conflicts and plots. And Pierce does a good job of giving the reader enough backstory and reminders from the first book, so even if you’re like me and are resuming this series after a long absence, you should be fine. 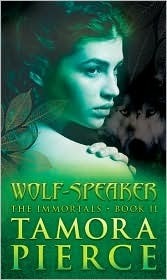 As is also the case with Pierce’s books, there is almost no setup – Wolf-Speaker starts practically in the middle of the action, with a wolf pack (the same pack who Daine briefly ran with after her mother’s death, when she nearly lost her own sense of humanity) contacting our heroine and asking for help. The pack’s habitat is being threatened by human development, and they want her to intercede for them. Meanwhile, the rulers who control the land where the wolves live are also plotting against the king of Tortall, and let’s not forget that the Immortals (powerful ancient monsters/gods who recently got released into the world) are quietly and not-so-quietly moving around the country. Reading this book gave me strong flashbacks to The Woman Who Rides Like a Man, the third book in the Alanna series. I still consider it the weakest of the series, because after the absolutely breakneck pace of the previous books, this one seemed to move at a snail’s pace while we watch Alanna hanging around in the desert and helping a local tribe. Wolf-Speaker suffers from the same problem – despite the fact that there’s plenty of conflict, everything feels so slow. There’s also a lot of repetition, because this book has Daine experimenting with her powers and learning to enter animals’ minds, and it means that we have to read essentially the same scene over and over as she practices this skill on various animals. This repetition works for younger readers, but I was pretty bored for most of the book. The conflict itself – rebellion against the king, aided by Immortals – isn’t very interesting either, mainly because we’re meeting the antagonists for the first time in this book, and the fact that Daine spends most of her time with the wolf pack means that the bad guys never get to do much. Failing to properly develop the villains, and removing Daine from the action for the majority of the book, means that the stakes never feel as high as they should. Not that I disliked the book, overall. The fact that most of the characters are animals, each with their own personalities and conflicts, would have delighted me if I’d read this book as a child. Pierce is particularly good at coming up with animal names, and if you manage to get through this entire story without falling head-over-heels in love with Quickmunch the marmot, then I don’t know what to do with you. I liked the wolf pack, and child readers will have more fun reading about them than I did – it’s hard to get too invested in these characters when you know they’re just a detour on the way to the main action. Although the Alanna and the Daine stories have a lot in common, the series are trying to accomplish very different things, which becomes clear in Wolf-Speaker. Alanna’s adventures were all about teaching girls that their gender doesn’t stop them from being whatever they want to be, and that they can accomplish anything through determination and hard work. Daine’s books teach children that the world isn’t black and white, and that you can’t make judgements about people (or in this case, creatures) based on what they are or where they come from. This is a suprisingly complex concept for a kids’ series, especially since fantasy audiences are trained to think of all evil-inclined creatures as one singular hive-mind (Tolkien, bless him, assured us that orcs are pure evil and that’s that, and I think it set an unfortunate precedent in fantasy), and it’s really the only thing that saved this book for me – I’m looking forward to continuing this series, just to see how Pierce continues to develop this idea.